In the ambiance of metaphysical philosophy, there exist many kinds of mysterious events and esoteric phenomena. Hence, it is crucial to understand the basics of the two oldest types of Psychic practice on Earth: Psychic Reading and Psychic Channeled Reading. The differences between future prediction and dimensional communication inspire lots of interest in the paranormal world. Though Psychics and Mediums are able to contact the spiritual beings, there are several distinctions that differentiate them. What to Know about Psychic Reading? In order to make them distinct, let’s study the special traits of Psychic Reading first. Those gifted with the sixth sense out of humans’ five ordinary senses (sight, hearing, smell, touch, and taste) are able to work as the so-called Psychics who can tap to the future storage to make future predictions and reveal the hidden truths about someone or something. By interpreting a person’s aura or energy, it is possible to uncover lots of information from past to present and future. Along with that, Psychic readings also come in many forms like Tarot Card Readings, Palm reading, Dream Interpretation, etc. As the umbrella term for many other kinds of Psychic practice, Psychic Reading is normally used in various spiritual contexts. What to Know about Psychic Channeled Reading? While Psychic readings are done based on the readers’ intuition about the others’ auras and energy, Psychic Channeled Reading works with the spiritual forces to call for their help and support. It is the occultists’ goodness that can ask for the Spirits’ help and communication through dimension. The art of communicating with someone who has passed away is only accomplished by the so-called Mediums. In the spiritual realms, the Mediums are able to connect with many intangible beings from the dead to the Spirit Guides. Via trance channeling, the spiritual experts join the spirits’ world to add comfort and relief in the bereaved’s rooms. In the full trance, the trained Mediums generates the meditative state to contact the spirits and communicate with them to see if they have any unfulfilled hope or cherished word. The information revealed in each kind of Psychic practice is totally different. Psychic Readings pay much focus on the clients’ details of life and their future prospects. 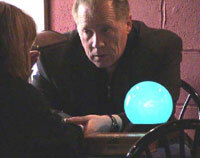 On the other hand, Psychic Channeled Readings primarily aim to deliver the dead’s messages to the clients. Thus, whenever you want to peek at the far-off scenarios, come to meet the Psychics rather than the Mediums! Otherwise, when it comes to the time of the death’s communication, it is welcomed to join Mediumship within Psychic Channeled Reading. By getting the differences between the two, every seeker can make the right settlement on their own targets. Thanks to the right attitude and purposes towards the two kinds. Now, you can get involved in the best one of favorite and reduce the risk of incompatible counseling. After all, if you want to unveil the secrets behind your birth and future, contact the Psychic readers! Differently, no one can replace the weight of the Mediums who are expert at channeling and communicating with the intangible spirits to release the bereaved’s painful loss and grief. In the quite places, make the direct connection to the practitioners of your interest. Then evaluate their abilities for no cost via Online Chat, Email, and Telephone. It will never be redundant to gain REAL experience in both kinds since they eventually boost your existence on Earth. Bear in mind that the accuracy of the readings heavily depends on the environmental factors. Starting from noise level to the seekers’ thoughts! Especially, in case of channeling, make sure you come with the unsealed mind and full respect towards the spiritual forces. Don’t be shy of getting your inquiries regarding “Psychic Reading and Psychic Channeled Reading” entered here.